Soft Body Armor vests i.e., Level III-A Aramid) are excellent for fragmentation and pistol protection but will NOT stop rifle bullets. Level III-A is only tested to stop higher pistol velocity threats, such as 9mm SUB-machine-gun or .44 Magnum. For rifle threats the high velocity requires Level III or Level IV Rifle Plates (with a supporting vest as appropriate). 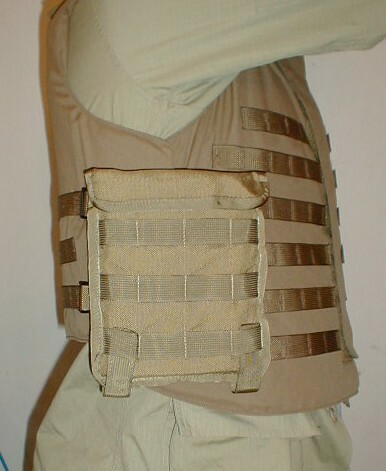 Front & Back Rifle Plates (also described as Small Arms Protective Inserts or SAPI) are superb protection for your vital organs, but the standard Front & Back configuration leaves a gap on your sides. ANY Ceramic Rifle Plate can be damaged if abused - especially if dropped on its' corner. They are not delicate, like fine tea china, but, on the other hand, FedEx and UPS are notorious for being rough with packages. So, every Ceramic Plate we ship FedEx or UPS is bubble-wrapped, and then DOUBLE-boxed with lots of padding to survive rough handling. We overpack, so that it would take a lot of obvious abuse to do any damage. We stake our reputation of over ten years on doing it right. Don't buy a plate that just gets thrown in a box and shipped out. MOLLE web strips on the outside of pockets for more MOLLE "real estate"
6" by 8", 7" by 8", 8" by 10"
plus more MOLLE real estate left over on the outside of your cummerbund. 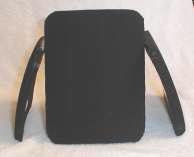 This Ultralight plate is manufactured on an ISO-certified production line, but you should know that the ballistic performance of all Polyethylene may be adversely affected, or permanently reduced, by prolonged exposure to ambient temperatures below ~ MINUS 15°F ( - 26 °Celsius) and over 175 °F (79 ° Celsius). Polyethylene plates must never be exposed to open flame, excessive direct sunlight, UV exposure or any hot surface. Heat damage to the external surface (e.g., melting) is a visual clue that the plate may have been exposed to elevated temperatures. If damage is found, replace the plate. unprotected on top of metal baking in the sun, etc., etc. If it's too hot for your body, DON'T LEAVE YOUR RIFLE PLATES THERE! Also known as bicep or deltoid protectors, this modular set plugs your vest's armpit / shoulder gap by adding Velcro-detachable Upper Arm Protection. Covers the Bicep, Tricep and Deltoid in Level III-A protection. Easily attached to Interceptors / OTVs, and all of our Tactical vests, with a strap to the vest at the shoulder, and elastic/Velcro around the bicep. Protecting the upper arm is important, but most critical is the fact that you now have good cover for the shoulder and armpit gap that is open by necessity on all vests. Velcro-adjustable positioning to optimize coverage for your arm. Velcro-adjustable positioning to optimize coverage for your arm position. An Ultra-light plate to stop Level III threats. 100% high molecular weight Polyethylene is ~.9" thick (~23 mm. ), and more expensive, but INCREDIBLY LIGHT. The main tradeoff is you don't get a protection rating for Level IV Armor-Piercing (AP) threats such as .3006 or 7.62 by 51mm AP, or the semi-AP 5.56mm SS-109 / M-855 (the M-16 round). Will stop the common AK-47 MILD Steel Core 7.62 X 39mm threat, though. You should know that the ballistic performance of ALL Polyethylene may be adversely affected, or permanently reduced, by prolonged exposure to ambient temperatures below ~MINUS 15°F (-26° Celsius) and over 175°F (79° Celsius). Never expose to open flame, excessive direct sunlight, UV exposure or any hot surface. Heat damage to the surface (e.g., melting) is a visual clue that the plate may have been exposed to elevated temperatures. If damage is found, replace the plate.